Want to become a business excellence leader? Then participating in the Assessor Capability Building Programmes run by Tata Business Excellence Group is the first step for you. Every year, Tata companies participate in the TBEM External Assessments or Dip Check Assessments to seek an outside-in view of their progress. Qualified Assessors from the Tata group with a varied range of industry expertise carry out these assessments. 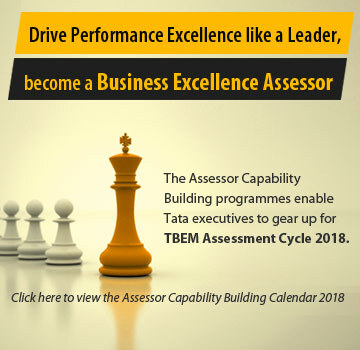 The Assessor Capability Building programmes equip new and experience assessors to analyse companies through the Tata Business Excellence criteria and make recommendations that are relevant to the company being assessed. The calendar for the 2017-18 Assessor Capability Building Programmes has just been launched. To view the calendar, click here. To nominate yourself for any programme, log in to tatabex.com and click on the Training Hub link under the Important Links section. To know more about these programmes or register, please login to tatabex.com and visit the Training Hub. Or write in to Subhrajit Basu at sbasu@tata.com or Nitin Choudhari at nchoudhari@tata.com.